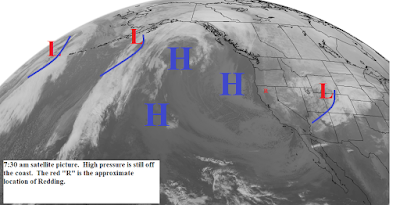 A low pressure trough is dropping southeastward from Alaska and will be off the coast tonight through Friday and then move slowly across Northern California on Saturday. Rain, heavy at times, is expected tonight and Thursday, along with strong gusty south winds. Wind gusts in north end of the valley will reach 50 mph with 65 mph gusts over the higher elevations. Snow levels will start out at 2000 to 3000 feet in the north and slightly higher in the south. Snow levels will rise a little Thursday. The precipitation will taper off Thursday night with scattered showers during the night. During this time the low will push a very cold airmass over the north state. The next round of precipitation will hit Friday with snow levels down to 500 to 1000 feet in the north and 2000 feet south. Gusty southerly winds are expected Friday. Saturday we will see partly cloudy to cloudy skies with scattered showers mainly over the foothills and mountains. Snow levels will be 1000 to 1500 feet. Sunday through Tuesday we will be under a weather pattern like the one shown on the map below. The jetstream will split as it crosses the Pacific and this will cause a low pressure area to become stationary to our west. The jetstream will reform by midweek and this will push the off shore low eastward. This system should bring rain to our area late Tuesday and Wednesday. 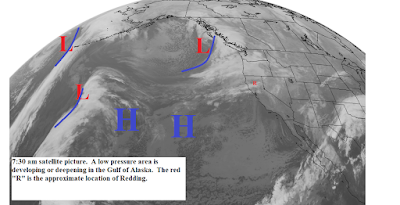 The low pressure area moved into Northern California last night and is now moving eastward. There are still some showers over the mountains but they will be ending during the day and skies will be clearing. Tuesday will be sunny and cool with gusty north winds. 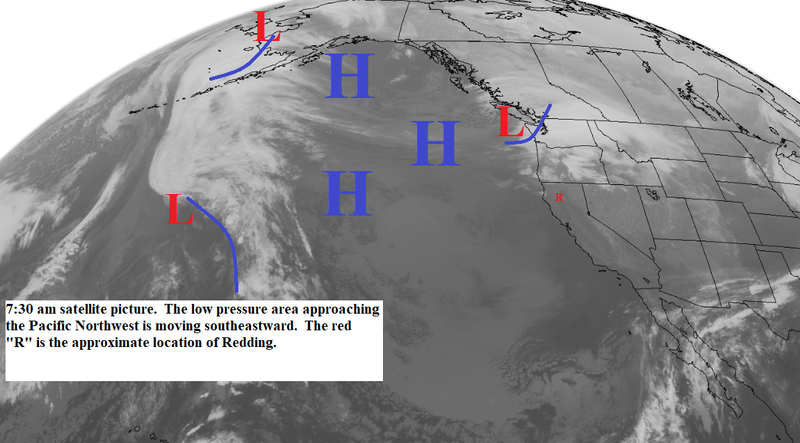 Clouds increase Wednesday as a low pressure trough deepens along the west coast. 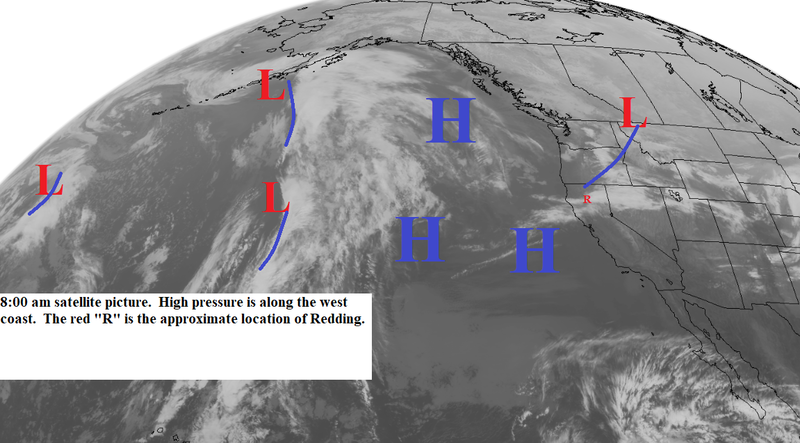 This trough will be along the coast from late Wednesday through Friday (see map below). 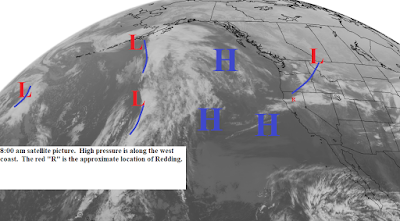 During this time Northern California will get periods of rain, heavy at times, and gusty south winds. Snow levels will start out 1500 to 2500 feet north and 3000 to 3500 feet south Wednesday night and then rise up a little Thursday. Snow levels will drop Thursday night and Friday to 1000 to 1500 feet north and 2000 to 2500 feet south. Saturday the low will begin to move eastward and the precipitation will turn to showers. Snow levels will continue low. Sunday and Monday will be partly to mostly sunny and then another storm is expected by midweek. Another relatively dry low pressure trough is moving through the area today. The low is currently over the Pacific Northwest and is moving southeastward. This system will bring a few light showers to the foothills and mountains with snow levels 1000 to 1500 feet north and 2500 feet south. This system will be east of our area by tonight. Clouds will increase again Sunday afternoon as another low pressure area drops southward. This system will be a little wetter and will bring showers to most of the area Sunday night and early Monday. The precipitation in the valley will be light and mainly in the north. Snow levels will be 1500 to 2000 feet north and 2000 to 3000 feet south. However, due to trapped cold air the canyons the snow levels from Redding northward will be locally 500 to 1000 feet. This system will be east of our area by Monday afternoon. Tuesday looks sunny but clouds will increase Wednesday as a low pressure trough deepens along the coast. Thursday through Saturday a large low pressure trough will be along the west coast (see map below). Northern California will have periods or rain Wednesday night through early Saturday. Snow levels will start out 2000 to 3000 feet north....locally 500 to 1500 feet due to trapped cold air...and 3000 to 4000 feet south. Snow levels will drop to 1500 to 2000 feet north and 2000 to 3000 feet south by Thursday night and Friday. Gusty south winds are expected late Wednesday and Thursday. Saturday we will have partly cloudy skies with showers mainly over the higher elevations. Sunday looks like a short break with more wet weather the next week. 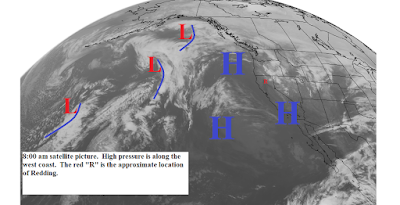 A large high pressure ridge continues off the coast with the jetstream running from Northern Canada along the coast and then turning east as it reaches California. This puts a very cold airmass over the west but the storms riding along the jetstream don't have much time over the water so their precipitation production is minimal. 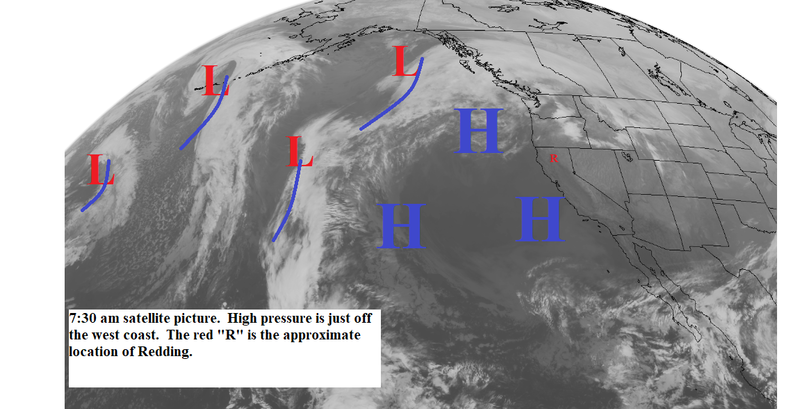 All of the computer models indicate that the high will move back westward and this will result in low pressure areas spending more time over the ocean before reaching our area. However, this change is not happening as fast as was indicated a few days ago. The next low pressure area is now along the Canadian coast this system will move through the north state Thursday. 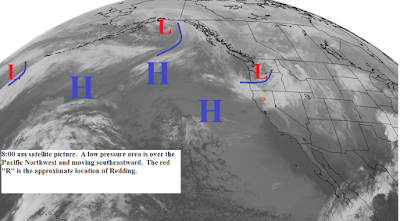 This is another cold storm and will bring showers to the foothills and mountains with snow levels around 1000 feet. Precipitation amounts will be light. 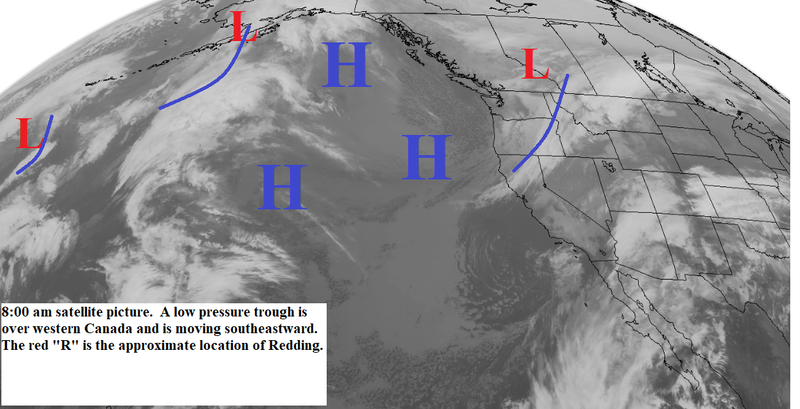 However, some areas around Redding could see a few snow flakes Thursday. Friday should be sunny and then Saturday the next cold but relatively dry low pressure trough clips the area with scattered snow flurries over the higher elevations. Sunday we are back to clear and cool. Monday and early Tuesday another storm moves through (see map below). This system may be a little wetter with a few showers possible in the north end of the valley. Snow levels will be 1000 to 1500 feet. Wednesday and Thursday next week look sunny and cool. Gusty north winds will occur behind each storm system. The low pressure trough that brought light showers and snow flurries to the foothills and mountains yesterday is now moving eastward. There will still be a few snow flurries over the mountains today but they will end by afternoon. The low has brought a very cold airmass over the north state and tonight and Tuesday night will be very cold especially in the wind sheltered valleys. Some north valley areas will be in the mid 20s. Strong gusty north winds will occur today. Tuesday we will have partly sunny to partly cloudy skies with a snow flurry possible over the higher elevations. 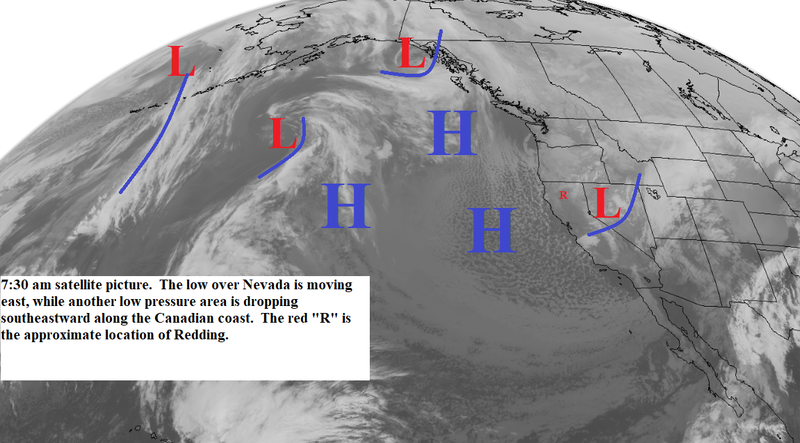 Late Wednesday and Thursday another low pressure area will drop southeastward along the coast and then move into the Great Basin. Like the last storm this system will not be over the water long enough to pickup much moisture so expect just a few mountain showers. Snow levels will be low around 2000 feet. Friday and most of Saturday we will have mostly sunny skies with cool temperatures. We may finally see a change late Saturday and Sunday. The past several storms have hugged the Canadian coast and then moved east. The map below for Saturday shows the jetstream shifting a little westward. This allows the low pressure area to come off the Alaskan coast and over the ocean before reaching Northern California. This would mean the Sunday and Monday storm would still be cold but wetter. 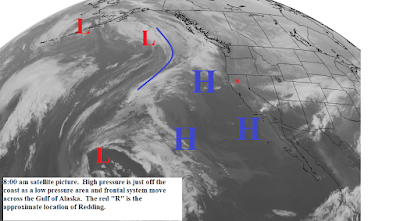 This morning's satellite picture (below) shows a low pressure area along the Canadian and Pacific Northwest coasts. This system is moving southeastward and its southern portion will move across Northern California late tonight and Sunday. This system does not have a lot of moisture but it is cold and will bring showers to the foothills and mountains with snow levels around 2000 feet. Gusty southwest to northwest winds will occur Sunday. The showers will end by early Monday. Monday and Tuesday the north state will be partly cloudy to partly sunny with gusty north winds on Monday. A very cold airmass will still over the area and Monday night and Tuesday night will be the coldest nights so far this winter....especially in the wind sheltered valleys. Some areas in the Northern Sacramento Valley will be in the upper 20s. Wednesday through next weekend we will be under a weather pattern like the one shown on the map below. The jetstream or storm track will continue to run from off the Canadian coast into the Central U.S. We will see partly to mostly sunny skies with daytime temperatures a few degrees above normal. 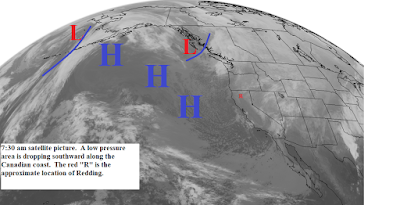 High pressure is still off the coast. Today will be sunny with temperatures a little cooler. 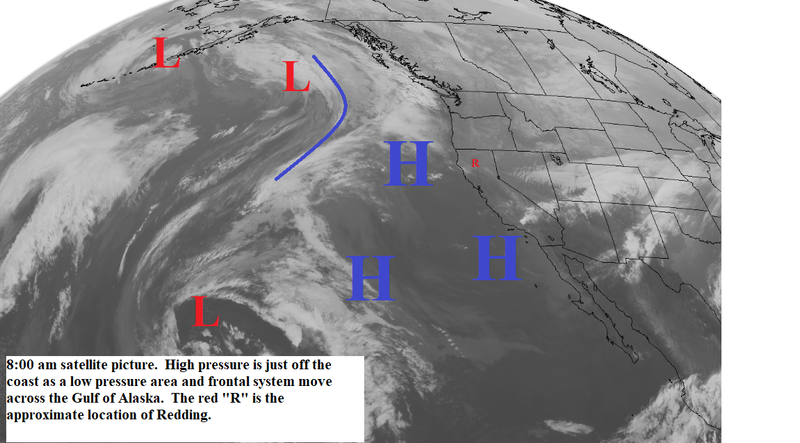 This morning's satellite picture (below) shows a low pressure area and frontal system moving across the Gulf of Alaska. This system will reach Western Canada and the drop southward across Northern California and Nevada...eventually ending up over Southern California by midweek (see map below). 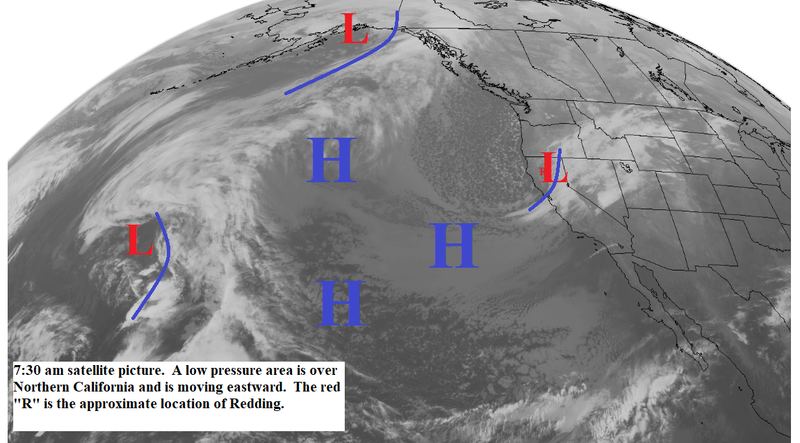 The low will move across the north state Sunday afternoon and early Monday. This system has very limited moisture and will only bring light showers to the higher elevations north and east of the valley late Sunday and early Monday. Snow levels will be around 4000 feet. Gusty southwest to northwest winds will occur Sunday. Late Monday through next weekend we will be back to a weather pattern with high pressure just off the coast. The north state will have mostly sunny skies and above normal temperatures. Strong and gusty north to northeast winds will occur Monday through early Wednesday.